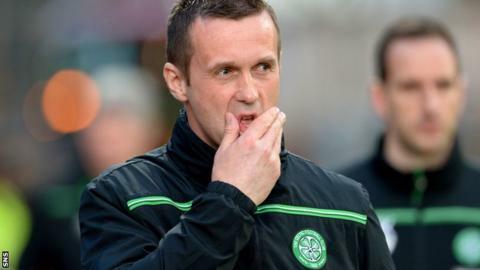 Ronny Deila is to quit as Celtic manager at the end of the season, with the Scottish Premiership leaders saying it was the Norwegian's decision. Neil Lennon, who Deila succeeded in 2014, has already said he would welcome a return to the Scottish champions. News of Deila's exit comes three days after a Scottish Cup semi-final defeat by city rivals Rangers at Hampden. "There have been some disappointments and times when we have not achieved what we had hoped for," he said. "I'm realistic and honest enough to admit that." Lennon is a free agent after leaving English Championship side Bolton Wanderers but is not the only potential candidate. Republic of Ireland assistant manager Roy Keane has been mentioned as a possible replacement, while two other former Celtic players - David Moyes and Malky Mackay - have not distanced themselves from the job in recent weeks. Deila, who arrived from Stromsgodset in his homeland, claimed in February that he would never quit Celtic. He led them to the title and League Cup last season and they currently lead the Scottish Premiership by eight points from Aberdeen with five games remaining. However, Celtic have had two disappointing European campaigns, failing to reach the Champions League group stage in consecutive seasons and finishing bottom of their Europa League pool this term. Deila's position had attracted increasing speculation, especially in the wake of the cup defeat by Rangers. "It is vital that the club comes first and, instead of me being the focus, hopefully now the team and the club can be the focus as we enter this final important period of the season," the 40-year-old told the club's website. "There have been some great times and I am delighted that we have brought some trophies to the club." Deila said he now wanted to focus on securing Celtic a fifth successive league title before leaving the Glasgow club. Celtic chairman Ian Bankier said Deila was "a fine man with strong values of honesty and integrity". "He has had some success, which we have enjoyed, and I know all our fans will back Ronny and the players as he looks to bring us more success in the shape of a second league title," he said. "The club, as always, will give Ronny our full support until the end of the season. We will then make a decision regarding our next manager with the objective of remaining Scotland's pre-eminent club." Celtic chief executive Peter Lawwell added: "Ronny has given everything to Celtic during the past two years and we thank him for his contribution to the club. "He is a man of real humility, someone of tremendous character, and I personally wish him nothing but success for the future."